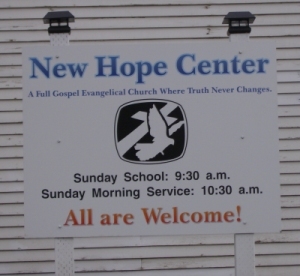 The group that formed New Hope Center church started by having prayer and worship at the home of Scott and Nancy Spencer, in 1993. The meetings at the Spencers were held on Sunday afternoons. The initial meetings at this church building were also on Sunday afternoons. Scott and Nancy Spencer, Ross and Joyce Clark, Craig and Esther Gibler, Violet Kimbel, Margaret Likes, and the first pastor, Rev. Jay Wagner and his wife Esther came to this old building to purchase it for the new location for this fledging congregation. This group stood in a circle and held hands in prayer. Mr. Ross Clark took a $100.00 bill from his wallet and stated that this was seed money for this building. Rev. Wagner and Mr. Spencer conferred with the Baptists on the purchase. They made an offer to purchase this church building, and the offer was accepted. The first meeting at this church building was on October 10, 1993. The first pastor was Reverend Jay Wagner with his wife, Esther from 1993 to 1998. The second pastor was Rev. George Moore from 1998 to 2002. The third pastor was Rev. Rich Schaus, from 2002 to 2006, and the fourth pastor is Rev. Richard Lee from 2006 to present. Richard Lee is the resident current pastor, who also serves as an evangelist and occasional chaplain. Richard Lee is a trained clergyman and practicing trial lawyer. Rev. Lee’s biography was published in Who's Who in America, 2000 Millennial Edition. He holds a Bachelor of Arts (B.A.) in comparative religion from the University of Washington, a Doctorate of Jurisprudence (J.D.) from Gonzaga University School of Law, and a Master of Divinity (M.Div.) from Fuller Theological Seminary. There is one God, eternally existent in three persons: God the Father, God the Son, and God the Holy Ghost (Deuteronomy 6:4; Matthew 28:19). In the blessed hope-the rapture of the Church at Christ's coming (Titus 2:13). Mr. C.O. Green, local building contractor and lumber yard owner, ordered materials to build this church for the Roman Catholic Bishop of Nisqually on June 6, 1899. 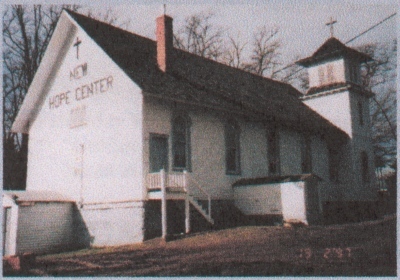 This church may be the second building erected on Nob Hill (as this part of town was called at the time). Much of the original fabric has been retained on this church, which is one of the oldest buildings in the community. 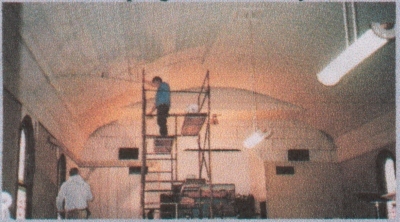 It later was the home of the First Baptist Church for many years. Our church is in communion with World Evangelism Fellowship of Baton Rouge, Louisiana. Richard Lee was influenced to go into ministry under the anointed preaching of Evangelist Jimmy Swaggart in the 1980s. The Lord has blessed the work of Son Life Broadcasting.